It is copyright © Okla Elliott and Jacket magazine 2010. See our [»»] Copyright notice. Since receiving my review copy of Demosthenes’ Legacy, I have read it twice, cover-to-cover, and cherry-picked through it enough to have likely read most of the poems four or five times. The book has traveled with me to Montreal for a month and has been a constant in my shoulder bag since my return about six weeks ago; yet the book has defied every attempt I’ve made, up till now (under duress of deadline), to review it. Why is that? Before I can answer, I feel it’s necessary to talk about a pet theory of mine, one that tries to find a proverbial ‘third way’ in the debate between highbrow art and entertaining art. I often talk of books that, capitalized, Entertain me, by which I mean they engage all of my faculties — high, low, and in-between. These are my favorite books, but they tend to be hard to pin down, to categorize; and let’s be honest, that means they’re hard to review because the reviewer has to think instead of offer up the same old phrases we’ve heard a thousand times before. Demosthenes’ Legacy consists of prose poems and a few pieces long enough to tempt me to call them short fiction (though I’m one of those people who is perpetually confused as to the difference between the two genres, where one ends and the other begins, etc). The opening piece makes use of the postmodern trope of a faux introduction to a lost manuscript written by Demosthenes. (Demosthenes, you should know, was considered the greatest Greek orator who, according to Plutarch, had a stutter in his youth, both telling facts given the eloquent-yet-stutter-like wordplay we find in Demosthenes’ Legacy.) Further confounding our taxonomic efforts, the introductory piece claims the other pieces in the book were ‘once thought to be an anthology of dictionary entries disguised as homophonic fragments or misplaced maxims, interspersed with a series of biographical accounts.’ So, we have prose poems and/or short fictions which are being presented to us as a faux manuscript of dictionary entries and maxims, with some nonfiction thrown in; but no, that’s not enough — a ‘recent panel of scholars’ has determined the pieces to be ‘word-pebbles or pebble-poems’, in short, an entirely new genre. The book insists on being all of these things at once. Okay… my inner Playful Postmodernist is entertained already and is fairly salivating at the possibilities of the book. But what about my other parts — my Pathetic Emotional Pushover; my Cold Structural Appreciator; my Lover of Good Stories, All Other Things Be Damned? Each of them gets his druthers at one point or another in the book, though admittedly some are more pleased than others (given that few pieces make use of the narrative mode, my LoGSAOTBD felt occasionally left out, but you can’t please all of me all the time). In many ways, this poem contains the DNA of the entire book. In the first sentence, we see the philosophico-theoretical impulse that shows up in many of the book’s poems. Conceiving of an object as a purpose and then having that purpose/object mounted on the wall are moves worthy of a Wittgensteinian treatise or a Deleuzean fancy. But it is more than mere theoretical whimsy; it is also an example of the well-worn dictum that all good literature either makes the familiar strange or makes the strange familiar. Here, I would argue Monroe is making the familiar strange by forcing us to rethink an object hanging on the wall as a purpose hanging on the wall. But the DNA described here is more complex even than that. With all the internal rhyming, Monroe partakes in one of the most traditional poetic tactics available. Were this poem lineated sentence-by-sentence, there would be only two lines that didn’t have an end rhyme, either pure or im-. Also, look at all the alliteration in the piece; yet a further use of quote traditional unquote tactics. Take this mixing of poetic tactics with the aforementioned genre hybridity, and we have a strange and wonderful species of literature indeed. A professor of comparative literature at Cornell University, Jonathan Monroe is certainly a scholar, a man fluent in theory and literary history, and that shows in his poetry — but he is a poet in equal measure, and that shows as well. This book expands, in its modest way, the range of American poetry as it is being practiced today, precisely due to its eagerness to explode several genres at once while making use of their tropes and tactics. And I can’t help but wonder whether it isn’t Monroe’s educational and professional background that makes this possible. In the same way the poems resist taxonomic efforts, so does their author. In Demosthenes’ Legacy, Monroe finds that difficult balance between experimental play and human gravitas. I do not mean to suggest that the book is perfect or that certain poems’ structures don’t fall in on themselves; it is not, and some do. 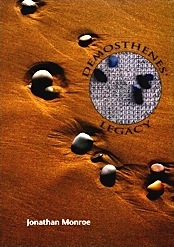 Demosthenes’ Legacy is, however, a fine book, one that Entertained me thoroughly, and one I recommend very highly. Okla Elliott lives in Champaign-Urbana, where he is the Illinois Distinguished Fellow at the University of Illinois. He received his MFA in creative writing from Ohio State University and holds a comparative MA in economics and politics from UNC-Greensboro. In addition to his American education he has studied at the University of Mannheim, Germany, and the University of Wroclaw, Poland, and at language institutes in Mexico and Quebec. His fiction, nonfiction, poetry, and translation appear in Circumference, Indiana Review, The Literary Review, New Letters, New York Quarterly, and A Public Space, among others. He is the author of two chapbooks of poetry as well as the co-editor, with Kyle Minor, of The Other Chekhov.